Die Veneris, 9° Decembris 1831. Cranstoun & Co. v. Bontine. Patison & Blincow v. Allan et al. Stephens to enter into a Recogce on Bush's et al. Appeal. Earl O'Neill takes the Oaths. Whittet & Greig v. Johnston et al. Cranstoun et al. v. Boutine, Respondent's Petition to lodge his Case, referred to Appeal Com ee. Nicol v. SirR. W. Vaughan et al. Court of Exchequer, Scotland, Paper respecting, Ordered. Ds. Cloncurry. Dux Norfolk, Marescallus. 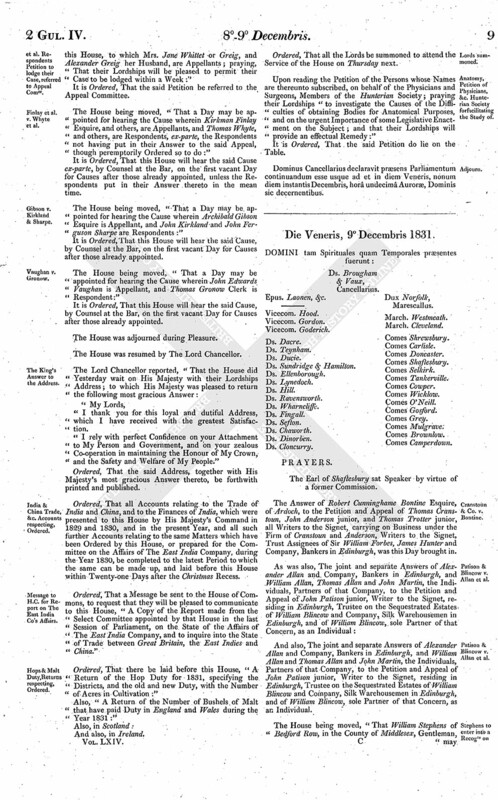 The Answer of Robert Cunninghame Bontine Esquire, of Ardoch, to the Petition and Appeal of Thomas Cranstoun, John Anderson junior, and Thomas Trotter junior, all Writers to the Signet, carrying on Business under the Firm of Cranstoun and Anderson, Writers to the Signet, Trust Assignees of Sir William Forbes, James Hunter and Company, Bankers in Edinburgh, was this Day brought in. 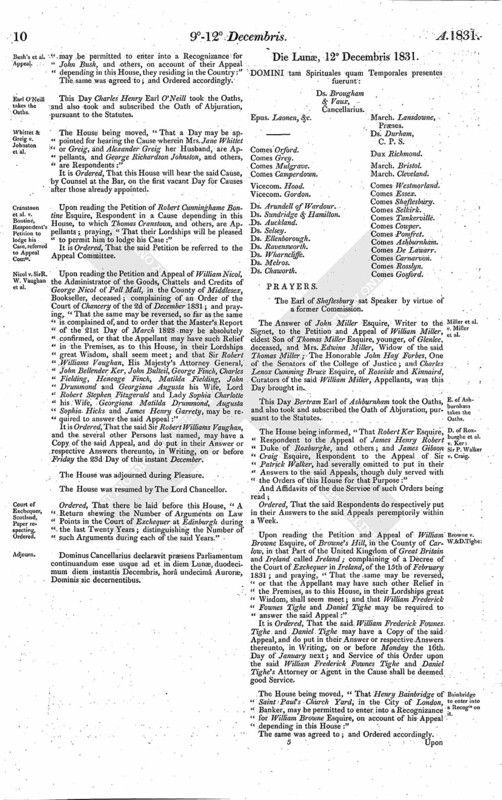 And also, The joint and separate Answers of Alexander Allan and Company, Bankers in Edinburgh, and William Allan and Thomas Allan and John Martin, the Individuals, Partners of that Company, to the Petition and Appeal of John Patison junior, Writer to the Signet, residing in Edinburgh, Trustee on the Sequestrated Estates of William Blincow and Company, Silk Warehousemen in Edinburgh, and of William Blincow, sole Partner of that Concern, as an Individual. The House being moved, "That William Stephens of Bedford Row, in the County of Middlesex, Gentleman, may be permitted to enter into a Recognizance for John Bush, and others, on account of their Appeal depending in this House, they residing in the Country:"
This Day Charles Henry Earl O'Neill took the Oaths, and also took and subscribed the Oath of Abjuration, pursuant to the Statutes. The House being moved, "That a Day may be appointed for hearing the Cause wherein Mrs. Jane Whittet or Greig, and Alexander Greig her Husband, are Appellants, and George Richardson Johnston, and others, are Respondents:"
Upon reading the Petition of Robert Cunninghame Bontine Esquire, Respondent in a Cause depending in this House, to which Thomas Cranstoun, and others, are Appellants; praying, "That their Lordships will be pleased to permit him to lodge his Case:"
Upon reading the Petition and Appeal of William Nicol, the Administrator of the Goods, Chattels and Credits of George Nicol of Pall Mall, in the County of Middlesex, Bookseller, deceased; complaining of an Order of the Court of Chancery of the 2d of December 1831; and praying, "That the same may be reversed, so far as the same is complained of, and to order that the Master's Report of the 21st Day of March 1828 may be absolutely confirmed, or that the Appellant may have such Relief in the Premises, as to this House, in their Lordships great Wisdom, shall seem meet; and that Sir Robert Williams Vaughan, His Majesty's Attorney General, John Bellender Ker, John Bulteil, George Finch, Charles Fielding, Heneage Finch, Matilda Fielding, John Drummond and Georgiana Augusta his Wife, Lord Robert Stephen Fitzgerald and Lady Sophia Charlotte his Wife, Georgiana Matilda Drummond, Augusta Sophia Hicks and James Henry Garrety, may be required to answer the said Appeal:"
It is Ordered, That the said Sir Robert Williams Vaughan, and the several other Persons last named, may have a Copy of the said Appeal, and do put in their Answer or respective Answers thereunto, in Writing, on or before Friday the 23d Day of this instant December. Ordered, That there be laid before this House, "A Return shewing the Number of Arguments on Law Points in the Court of Exchequer at Edinburgh during the last Twenty Years; distinguishing the Number of such Arguments during each of the said Years." Dominus Cancellarius declaravit præsens Parliamentum continuandum esse usque ad et in diem Lunæ, duodecimum diem instantis Decembris, horâ undecimâ Auroræ, Dominis sic decernentibus.